I haven’t really thought of myself as a “people photographer” in over a decade. I know I can get good shots of people and have in the past, but I just don’t do it very often anymore. This year however I made an effort to shoot people once again. I’ve known Bill Woodcock for over 15 years, but I rarely see him. 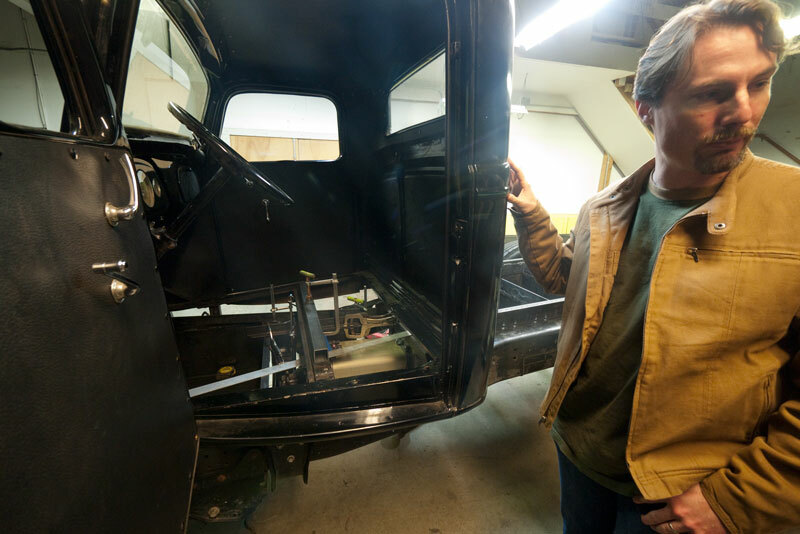 On a recent trip to the Bay Area for work I managed to zip up to Berkeley to check out one of Bill’s skunkwork projects – an EV conversion of a pre-war Ford truck. I like how this image captures both the project and its creator. Stacey, a dear Law School friend of Sue’s, was diagnosed with cancer last year. She and her husband came to Seattle last summer and we all met downtown for a nice dinner. 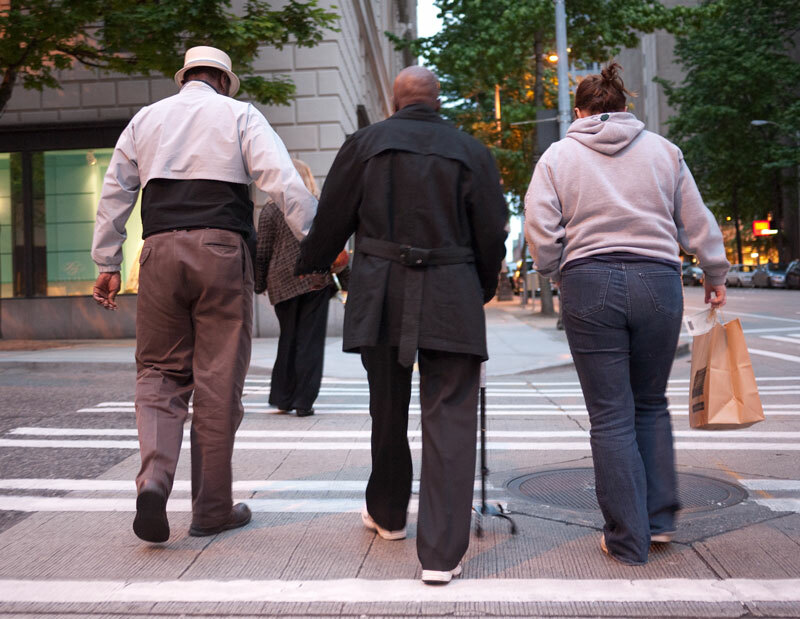 As we were heading back to our cars I snapped this shot as they crossed University Street. All sorts of poignancy in this image for me. Just looking at it makes Sue cry. 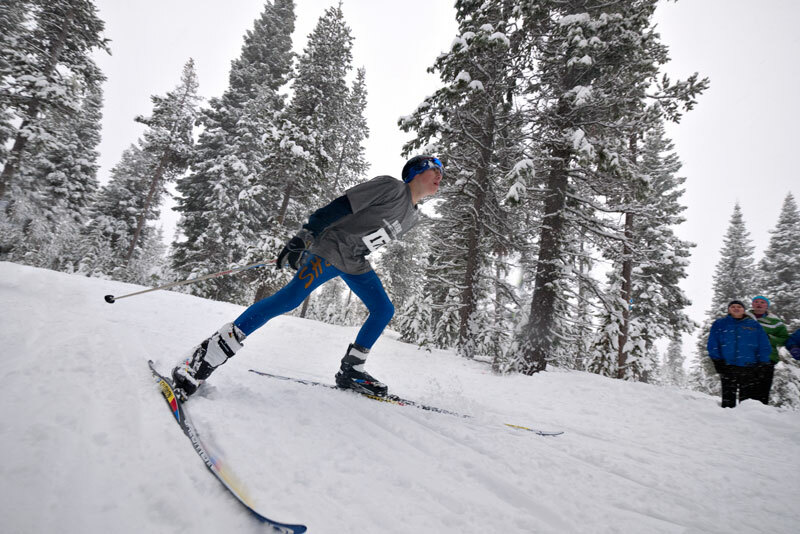 Nick took on a new sport this year, cross-country skiing. He joined the Bend High School X-CS team, and I tagged along with my camera to their first practice, and then their first race. I try to shoot at least one photo of every racer on the BHS team as they went by. This shot struck me as particularly good. At an X-C practice I stood off from the kids with a long lens so that they wouldn’t feel the need to “pose.” Sure enough I caught this wonderful moment between a girl and boy. Nick approaching the finish of his very first X-CS race. 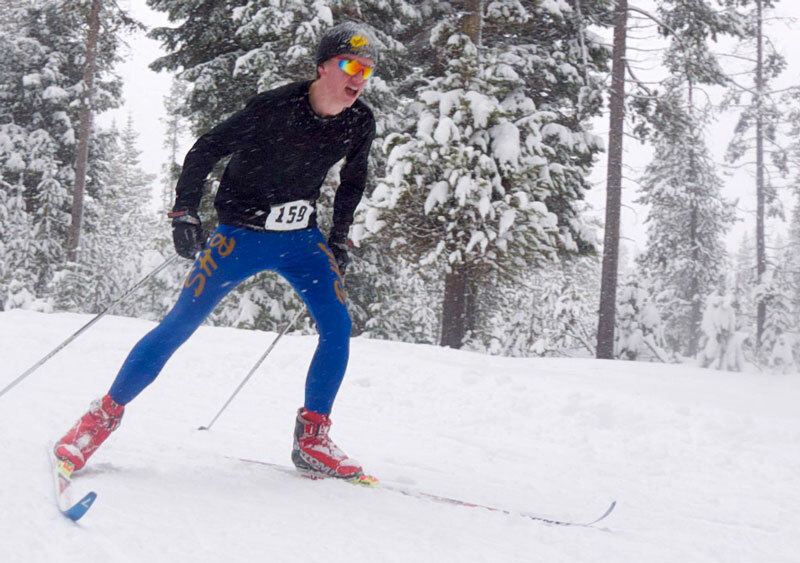 He passed several of his team mates and placed 7th out of 30-ish skiers on the BHS team. I was impressed! 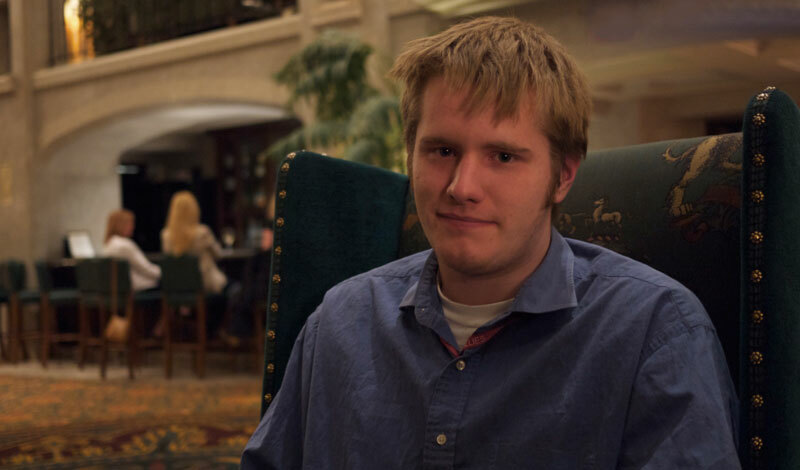 I like this photo of Chris, relaxing in the Banff Springs Hotel. He rarely smiles if a camera is pointed at him, but this half-smile is good enough for this one. In the “early days” (ie: September) at the Prineville site, when it was pretty much Ken Patchett & I as the only Facebook employees there, we’d take a ride out on the periphery of the property to escape the hubub of activity around the construction… mostly to clear our minds and mentally refuel. On one of these rides we found three beaver skulls. 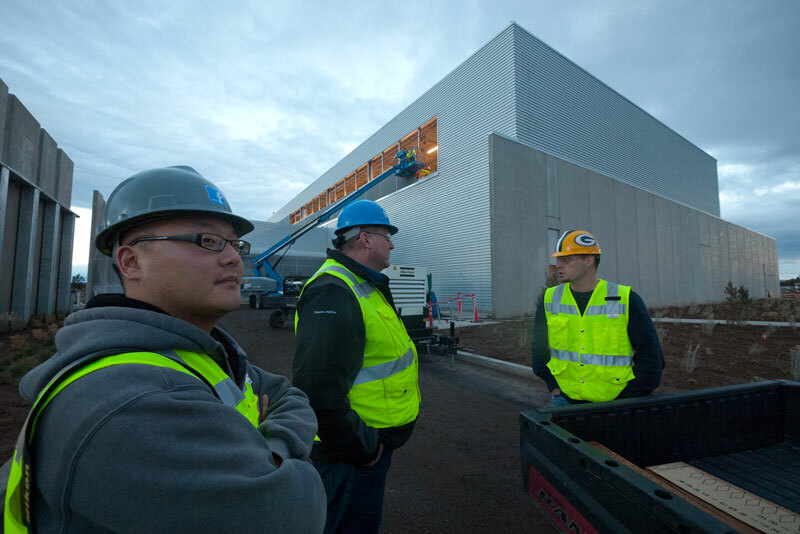 Four of us were standing in front of the Facebook Prineville Datacenter discussing some matter, when I whipped out the G1 with my favorite ultra-wide angle lens, and I tugged on the sleeve of Dan Lee, the Mechanical Engineer on the left side of the photo. I art directed him into position, the other two subjects, Ken Patchett and Joshua Crass remained oblivious to me and the camera as I shot. I posted this on an internal Facebook corporate page and the best joke caption was something about it looking like an album cover. Our office at the PRN1 site for the past 6 months has been a single-wide trailer. A handful of us Oregon FB staff, plus many visitors from FB HQ every week – until the main building is finished, we’re all packed into a small space. The weather for the past two months has been very cold. Brian is the Cabling Lead on site. I don’t recall what he said when I pointed the camera at him, but be assured it was a wise crack. This is my favorite “people shot” of 2010. 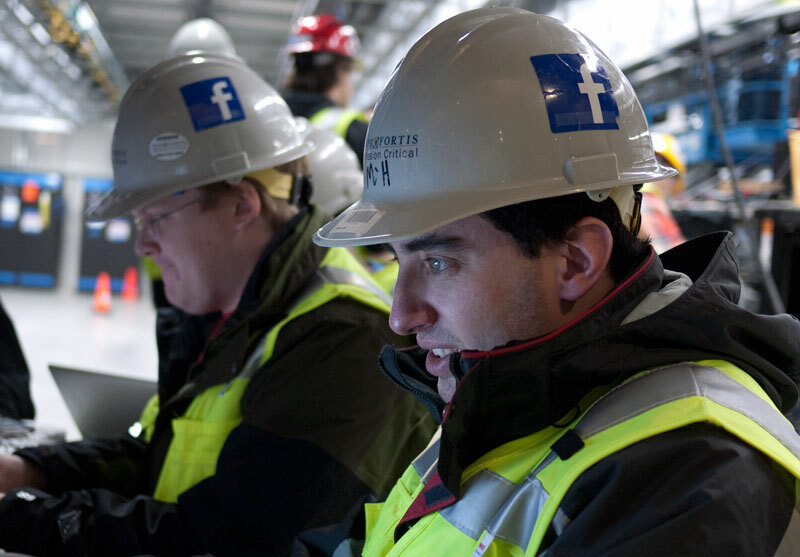 This shows Alex Renzin in the foreground, and Tom Cook right behind him – working to turn up core services for a cluster inside the datacenter while construction continues behind them. 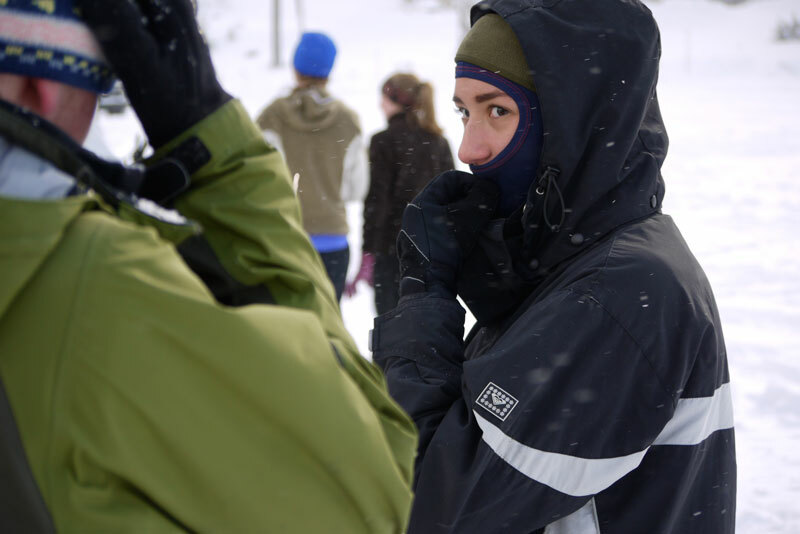 It was cold inside the facility that day, and Alex is all bundled up to stay warm. The cold light on his face from the LCD screen just reinforces the overall chilled impression. While I’ve taken part in several small-scale builds, Prineville is the first “greenfield” construction project I’ve participated in at this scale. It is a huge project – so large in fact that it is impossible to represent in any single image. My photographic skills were noted early on, so I’ve been appointed to archive the process. 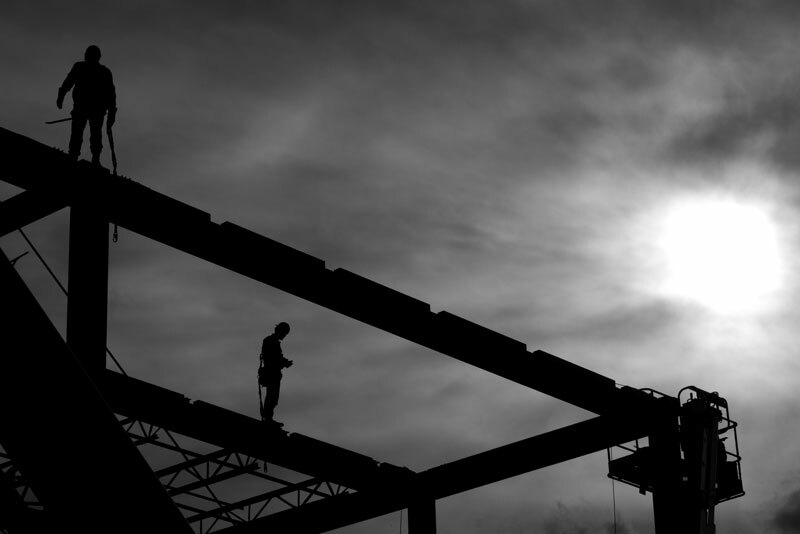 I never thought that a construction project would present photographic opportunities but once I opened my eyes and started looking around plenty of amazing images presented themselves. I post an image or two a day on an internal FB page dedicated to the project. Company policy prevents me from sharing with you any images from inside the facility that show any technologies specific to this installation, but here are my favorite images of what I can show you. I never think of shooting black and white, but this image just looked so much better in that format. Winter came early in Prineville this year, with the first snow arriving in October, and then once November arrived we saw snow almost every day. It dramatically changed the construction site, making a lot of work harder, but the upside came in the form of interesting scenery. 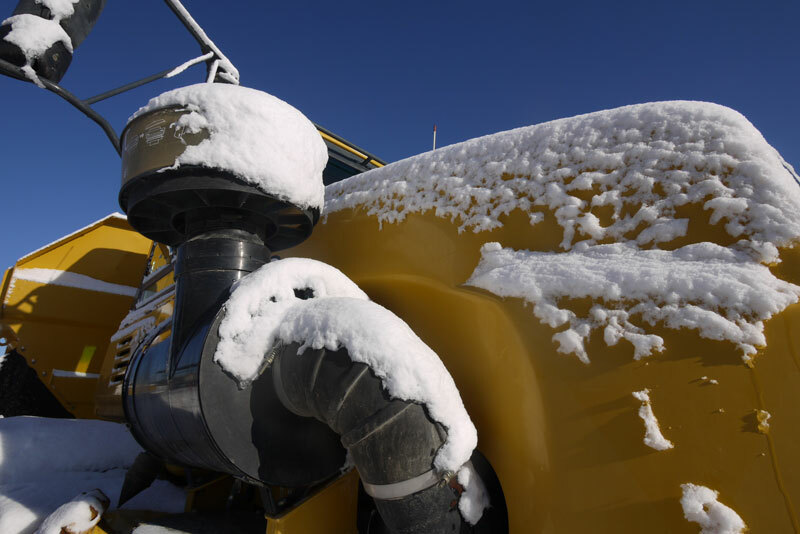 I love the mantle of snow on this truck. I left Prineville in early October for two and a half weeks. 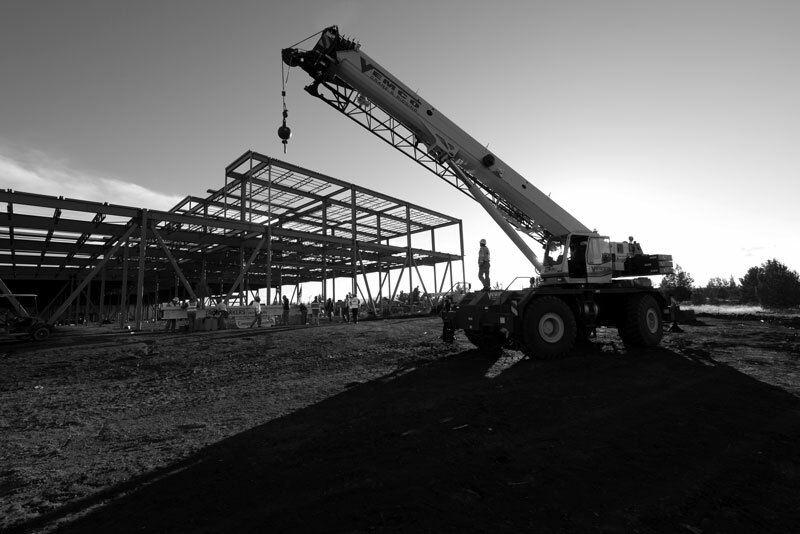 The extension we added to the north end of the building (effectively doubling the size of the facility) was only a set of steel fittings in the ground. 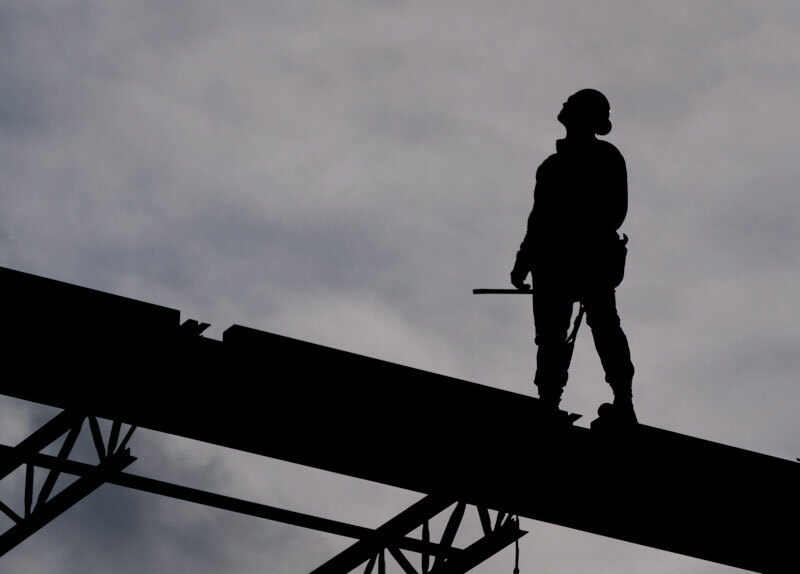 When I returned the Ironworkers were a day away from completion of their task. I escorted a reporter from the local newspaper out to the site to observe the “Topping Off Ceremony”, where the final high beam is put in place. She had to leave before it actually happened, but I stayed to watch it, and observed the Ironworkers complete their work. It was amazing to watch these guys work. They were so skilled, and so efficient – so it was no surprise how they were able to put up so much framework in so short a time. It was a privilege to later eat and drink with these guys, and share with them my photos from the day. One of these two images above was also picked up by the local paper, and an album of my shots was posted by Facebook on the public site for the project. 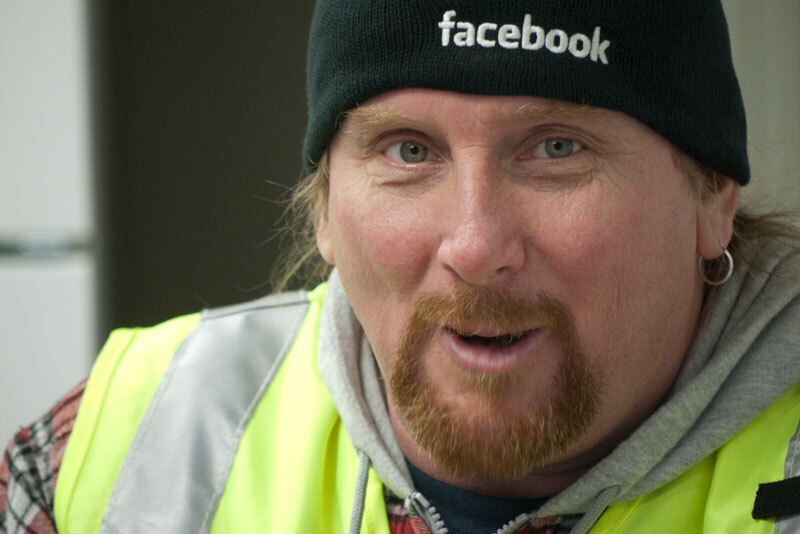 Jay Park is the man at Facebook responsible for designing the Prineville Datacenter. 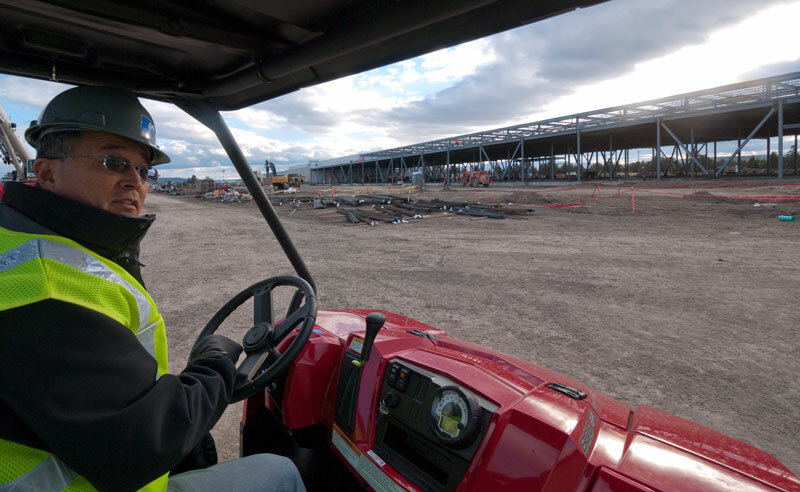 Here Jay drives a buggy around the site checking on project progress. My first task upon arrival in Prineville was handling the delivery and setup of this item. 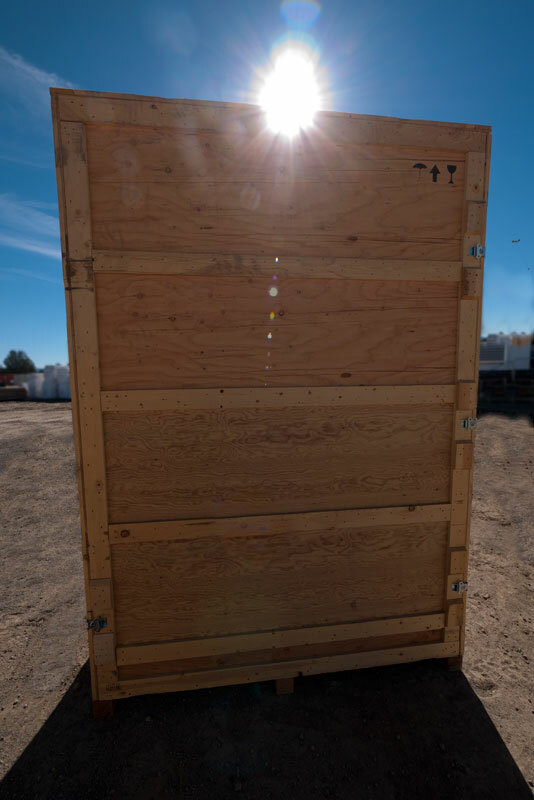 Yes, it holds a large, smooth, featureless black monolith. Want to see it? I’m sorry Dave, I’m afraid I can’t to that. 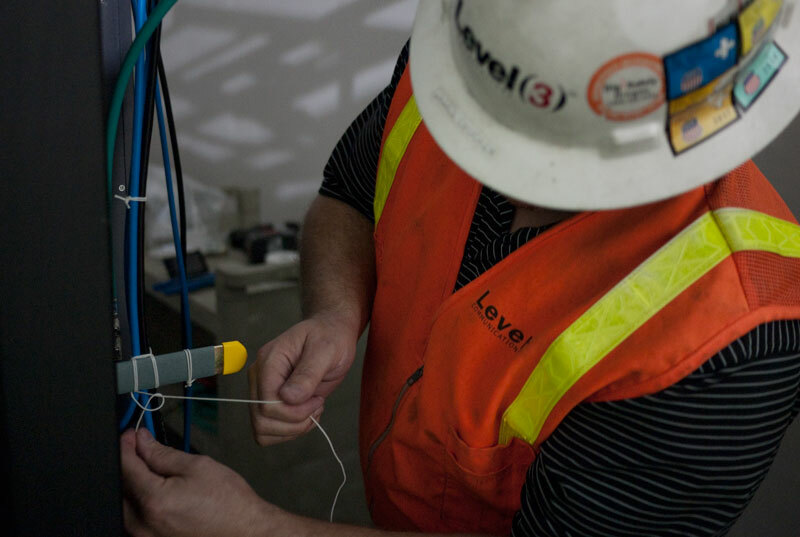 A Fiber Installation Tech does it old school. 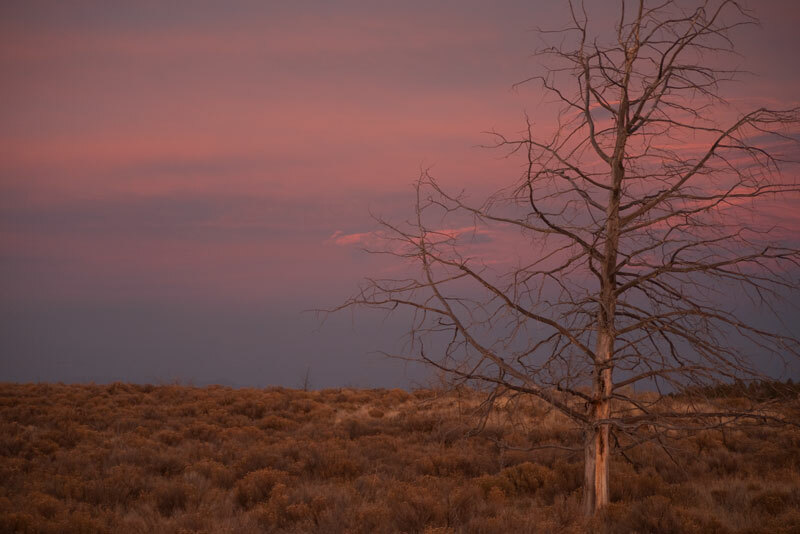 One of the great things about the Prineville Project is the overall happy nature of the site. Everyone is glad to be there and the morale of the site is very high. I’m always impressed with the friendly nature of everyone here. 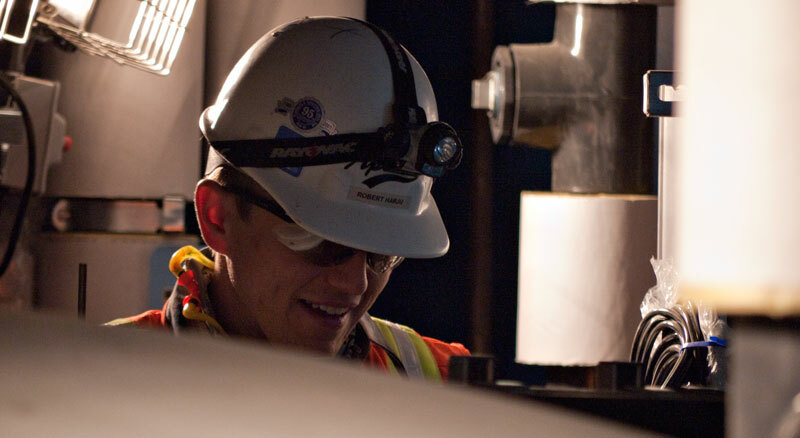 This image captures just a bit of the spirit, with Pipefitter Robert Harju cracking a smile as he works. 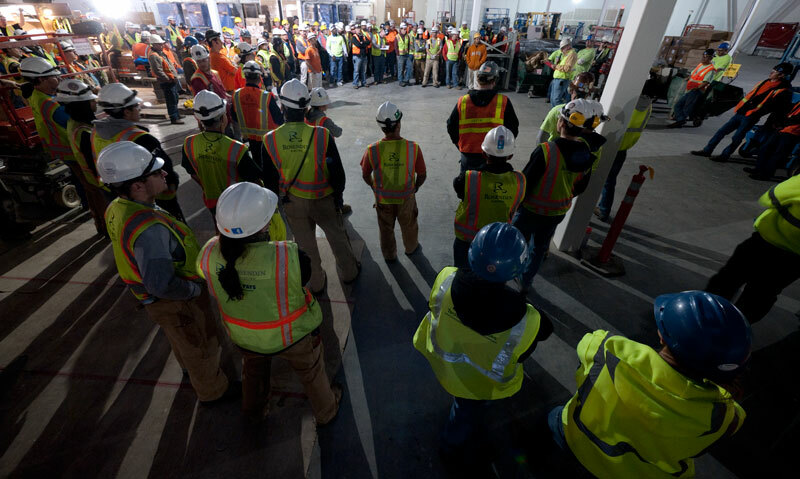 Every Wednesday all the workers on the site pause for a Safety Meeting. I was assisting a contractor with the network configuration of their equipment, and was near the spot where the meeting took place. I quietly wandered around and took shots with the self-timer and the monopod. I like the lighting and composition of this shot. A recent milestone was the completion of the walls on the north extension of the building. Once enclosed, work could begin on the inside. 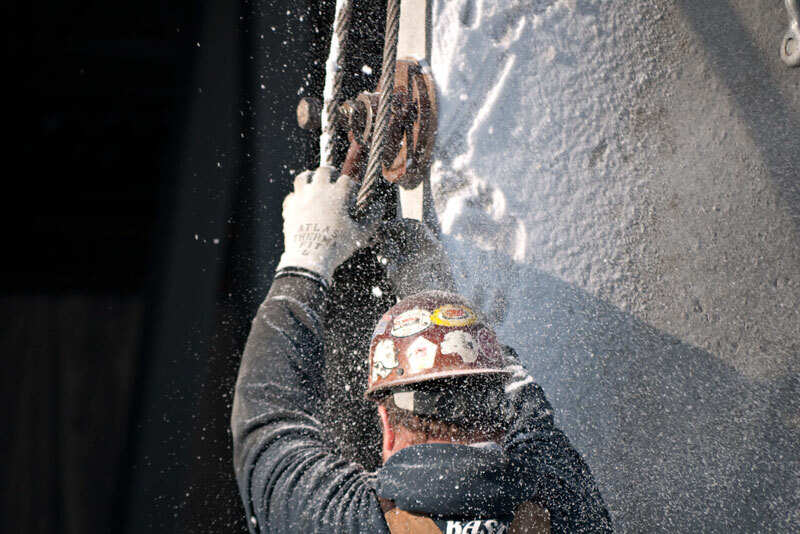 I happened upon this scene where a worker was removing some of the crane hoist points on a concrete wall slab, and the vibration caused the collected snow on the slab to fall all around him. Slabs arrive on a flatbed truck, and then are lifted into place, so the top slab in this case was covered with snow. 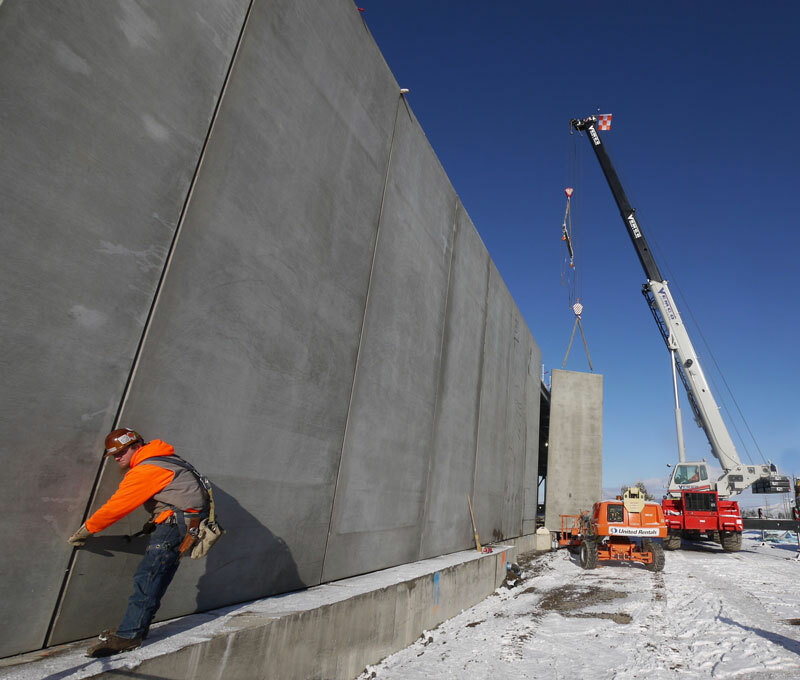 This image was picked up and published by the local newspaper a few weeks ago – illustrating the wall completion milestone of the project. I remember because they made me go back out onto the site and find the guy pictured to get his name. 2010 was an odd year for me – truly life-changing. I left a company that I was instrumental in starting, growing, moving and expanding. I’d honestly reached a point of … I won’t call it “burn-out” but more like a “loss of joy”. There wasn’t any enjoyment happening anymore. I looked for another gig and had some amazing adventures in that process (after a year passes perhaps I’ll tell the tale!) 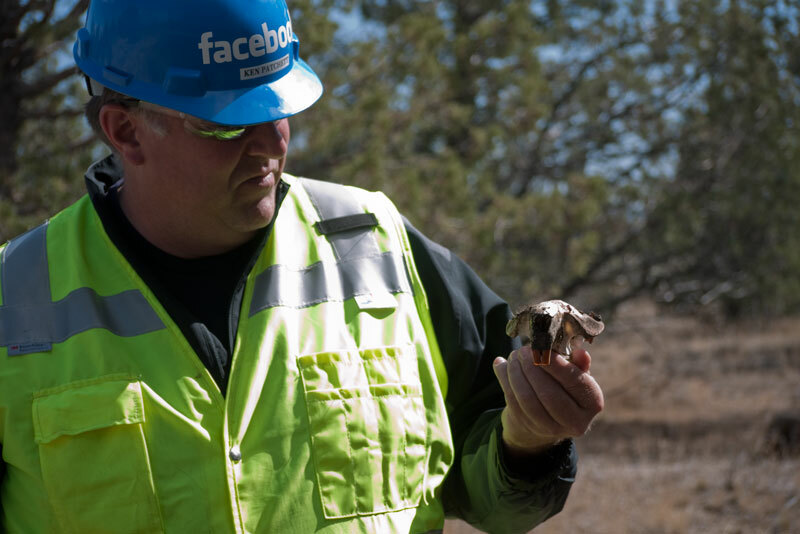 But one announcement In our industry just seemed to be a bit of destiny: Facebook committed to building a datacenter in my wife’s hometown of Prineville, Oregon. Facebook had called me in the autumn of 2009 about a datacenter-related job, and I ended up declining to interview because it was in California. But now they were building in central Oregon, where we have family ties. I contacted the recruiter who had called me before and threw my hat into that ring. I accepted an offer in late June, and started at Facebook the first week of August, 2010. In September we moved to central Oregon, to a nice 3 acre property in the country east of Bend, and southwest of Prineville. What does this prologue about life-changes have to do with Photography? Shot on the “rest day” of the 2010 Northwest Passage, this is the only image I’ve ever really used a photoshop filter to cover its entirety. I like the outcome. A real highlight of the 2010 Northwest Passage was attending with my son Christopher, as well as my parents. This shot is Chris at the check-out point, the starting line as it were, of the first stage, on the first day of the event. 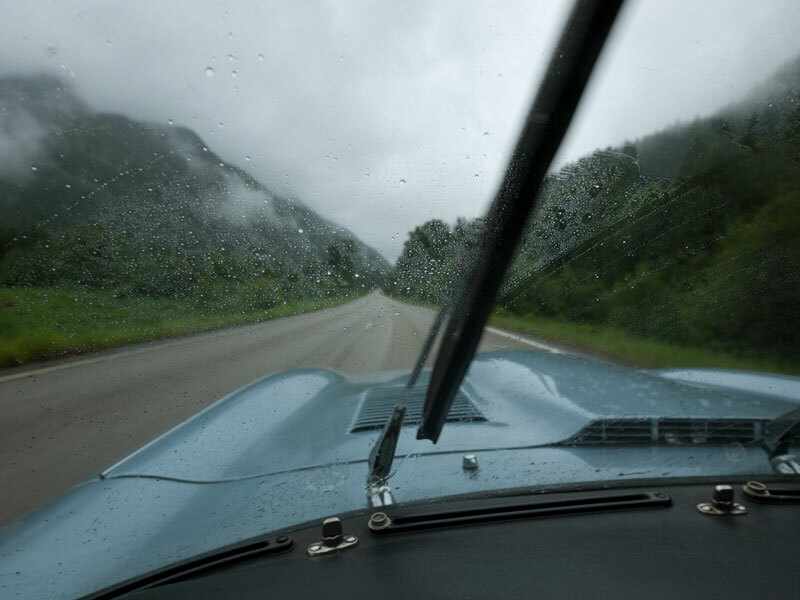 It captures the intensity of Vintage Rally Navigation so well. He’s got his route book, and he’s eyeing the clock with laser-like focus as the Rally Timekeeper counts us down to our check-out time. Chris did an amazing job on this event and we zeroed the entire rally, thanks to him. The Northwest Passage could have been called the NorthWET Passage this year, as it was bookended by bad weather at the start and finish of the week-long event. Here you can see the futility of depending upon British Engineered Windscreen wipers. Rain-X FTW! This image from the NWP was chosen for inclusion in the 2011 XKEdata.com E-type Calendar. Order yours here. I shot this blind, over my shoulder while driving, yelling at Chris to duck. Sometimes it works. 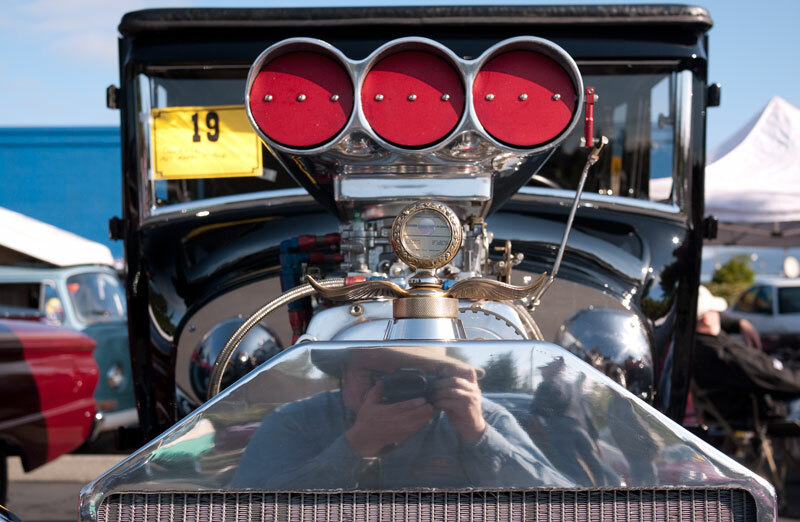 Shot at the local car show in Arlington, WA. 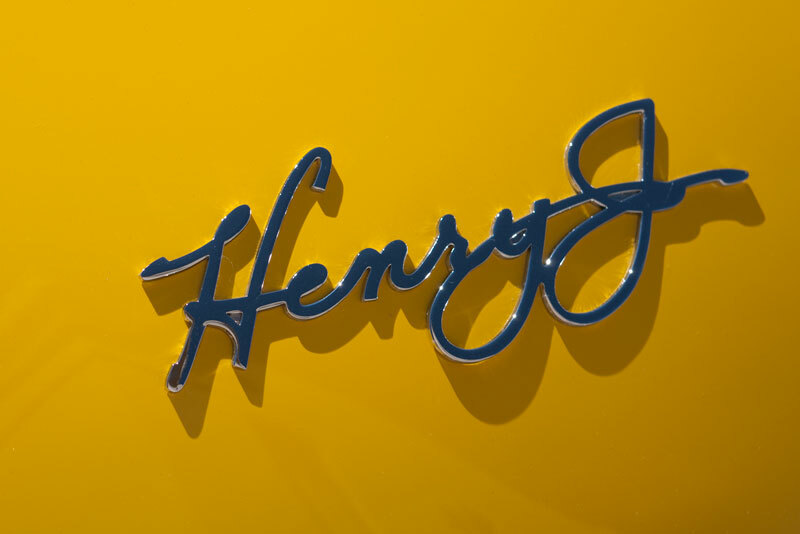 I’ve only ever seen two Henry J Kaiser’s car in the flesh, and both were yellow. I shot this on a trip to Texas in May. 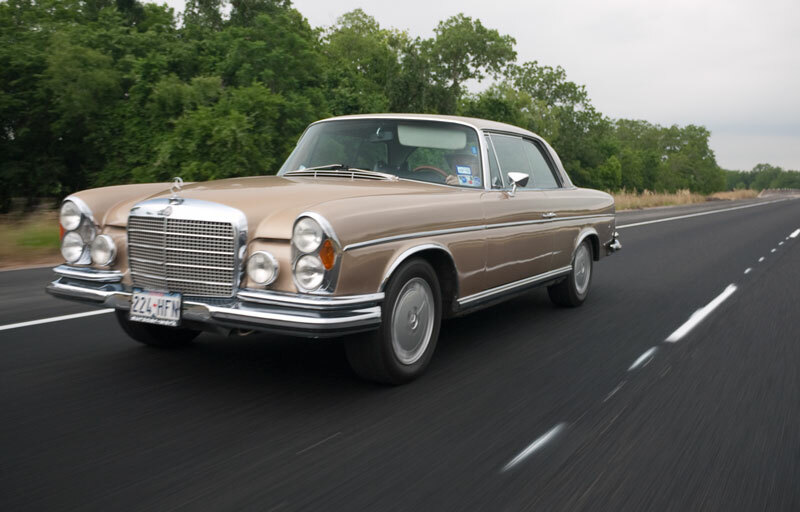 It is one of the first S-Class Mercedes-Benz models, a 1971 280SE 3.5 Coupe. 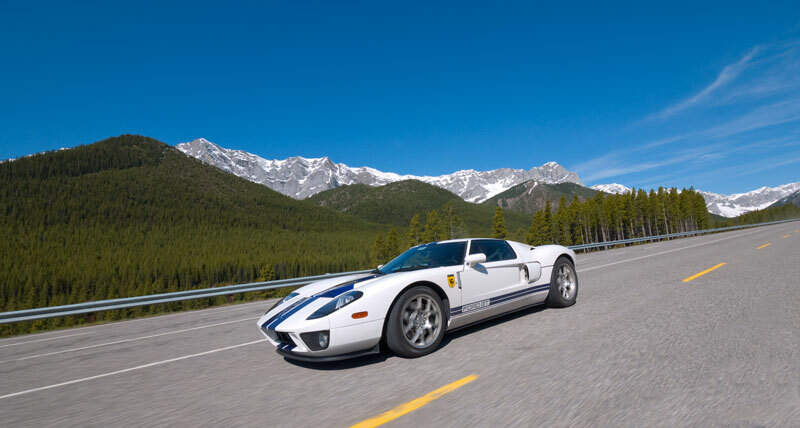 Classic machine. 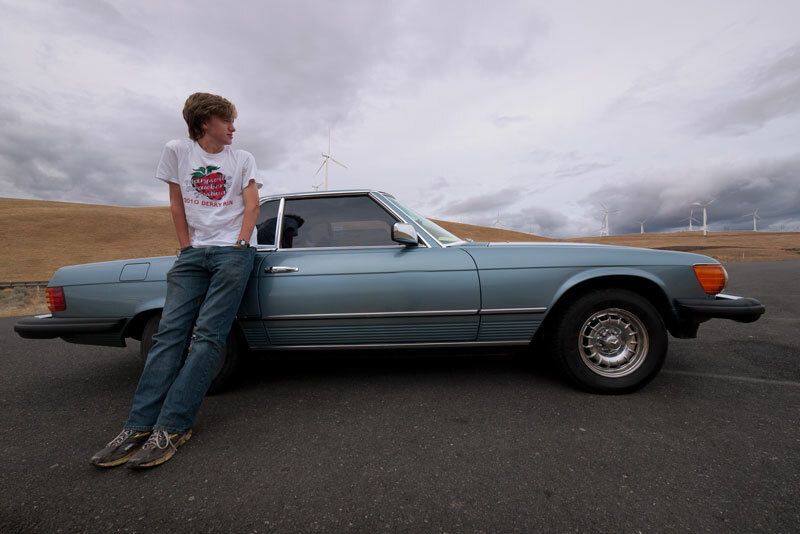 In September Nick & I drove the 450sl, aka “The Cruise Missle” down to Oregon for our move. We stopped at Maryhill under gathering clouds and I grabbed this shot. This photo is my favorite of 2010. My friend and 2008 Going To The Sun Rally Co-driver Mark Collien lives in Maryland and while I was working at Facebook’s east coast datacenters in October I took a Saturday drive with Mark and some other British car folks. 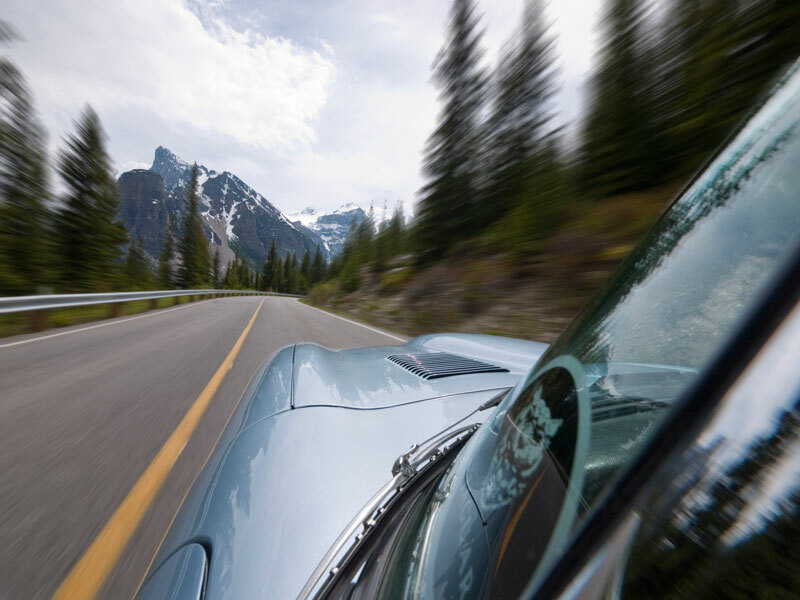 I shot this with the 7-14mm lens out on the end of an extended monopod over Mark’s shoulder. This is straight off the G1’s sensor… no photoshopping here. 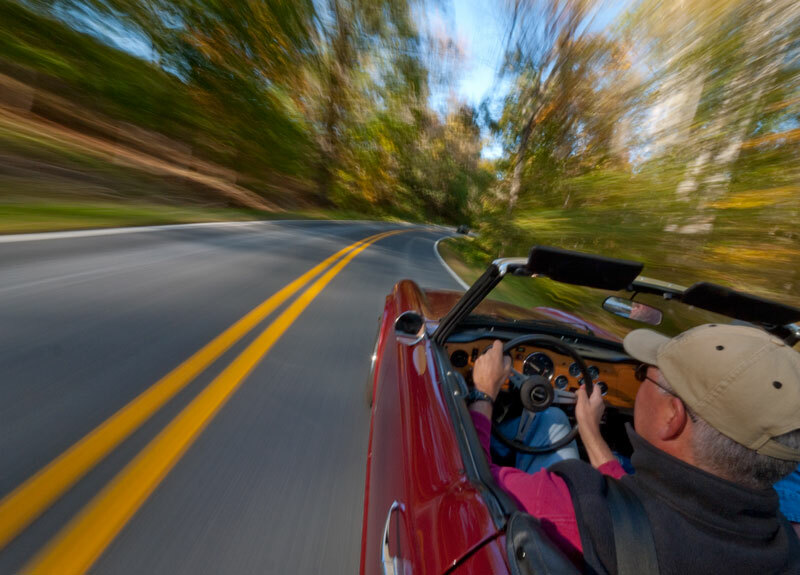 I took a few tries to get the motion blur right via shutter speed. Lots of wasted shots here as we were going from light to shadow and the exposures were often off. 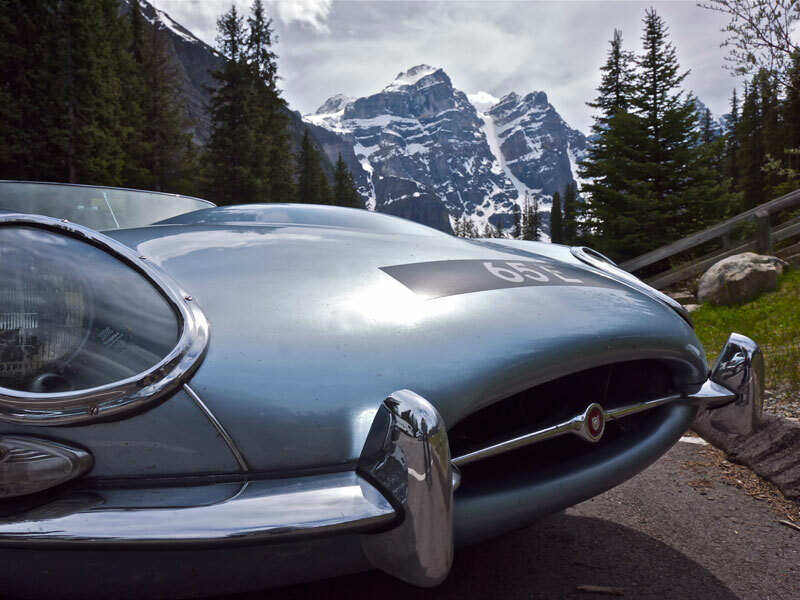 This one captures the essence of vintage motoring quite well. I watched in awe one November evening as the sun set and lit up the unusual clouds. I finally had to stop along the roadside, and using my car’s roof as a tripod/shooting platform, shot several mid-length exposures. This was shot from the road in front of our “office” which consists of a construction trailer. 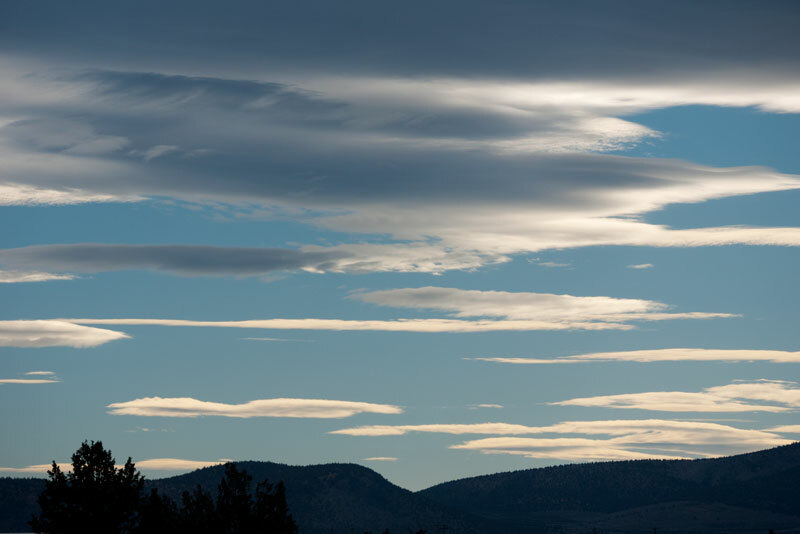 Looking southwest to the east shoulder of the Powell Butte massif, these cold winter clouds have a typical central Oregon look to them. 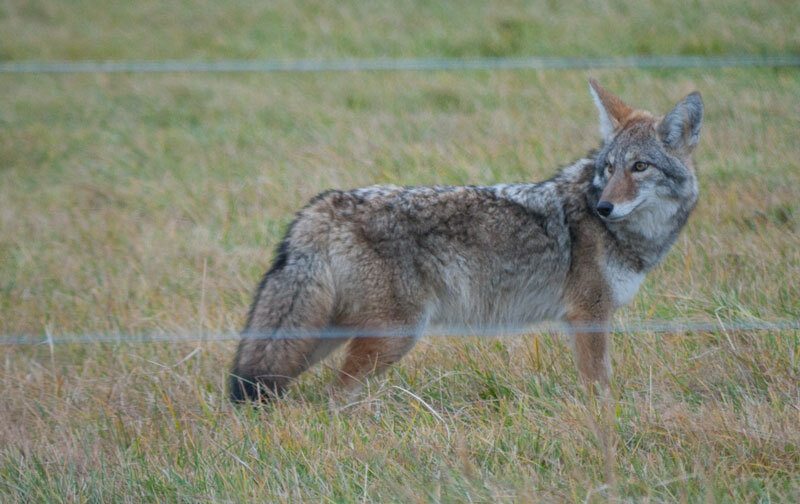 I was driving to work one October morning when I came around a corner and spotted a coyote in a farmer’s field. I went down the road a bit, turned around then came back to where the coyote was and parked on the shoulder. Oddly, this young coyote seemed too focussed on hunting a field mouse than being aware of the cars speeding by on the Powell Butte Highway. Its head was looking away most of the time, but I managed to get this shot as the coyote looked back over its shoulder once. 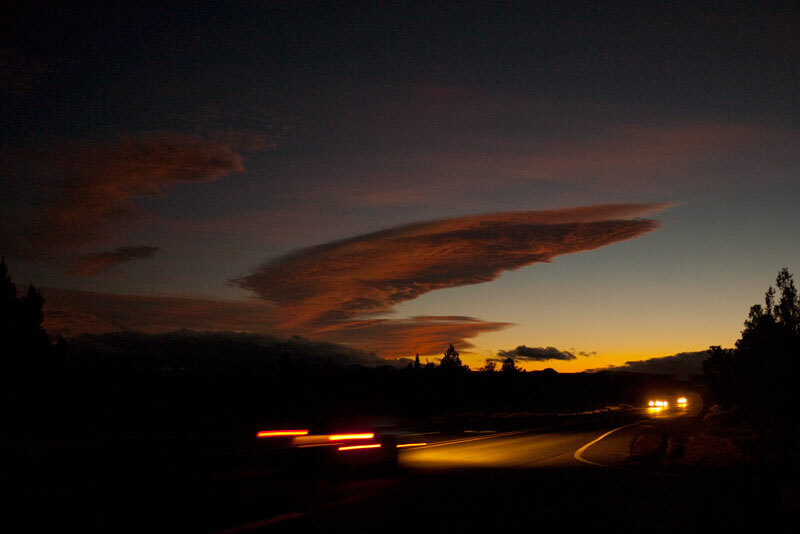 Both of these images were shot on the same evening. 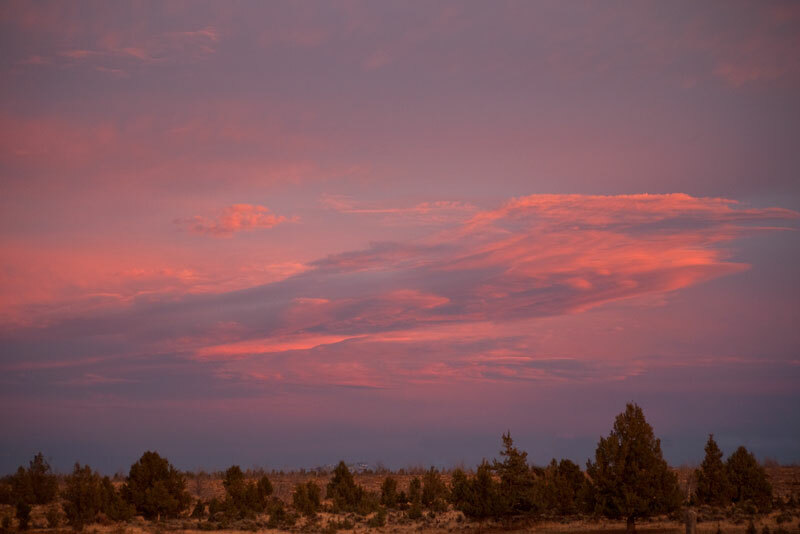 Central Oregon has some of the most spectacular sunsets and this evening near Horse Butte was truly incredible. I was afforded mere minutes to capture the brilliant colors here before the sun sank below the Cascades to the west and turned everything blueish-grey. Next: People & Construction shots. 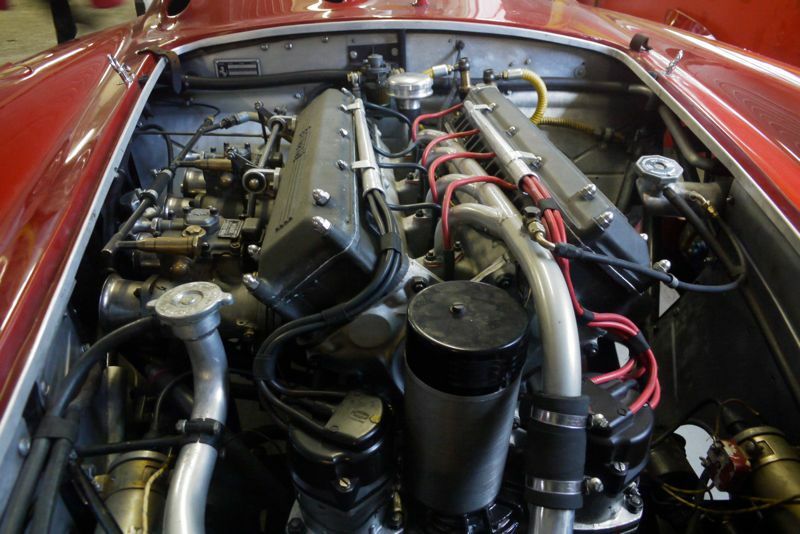 Can you name this car? This company is not known for building engines in this configuration, but you already knew that.